Design is action, and action is the difference. While it was noted that an evaluation of this work would not focus on formatting and presentation, FHC as a service/product is premised on action: the provision of information alone has proven less effective than information coupled with an undertaking. In this spirit of action — which is a principal tenet of my professional philosophy — I determined to design my vision for scaling FHC instead of simply describing it. It's a first pass, unrefined, and in that regard, unvarnished; but I believe it does something more to communicate a plan for scale than text alone. I benefited from and integrated lessons from deeper reading on the history of FHC, as well. Section 1 answers Assignment No. 1, namely a brief account of an innovative idea I can say I own conceptually. Section 2 answers Assignment No. 2, namely a link to an article on human behavior that I find interesting. I provide two links — one that is relevant to scaling FHC, and another I find significant on a wider level. Finally, Sections 3a, b and c speak to Cashcare (healthcare for liquid capital), a suggested solution for scaling FHC. This concept is disconnected from the distinct Indian project of the same name. For the love of ideas. Over the years, I have had many ideas I wish I had the time and resources to pursue: long-range wireless transmission of electricity; an online writing community that deploys CC0 licensing to drive the propagation of members' works (I worked with Mikael Cho on the earliest iteration of Unsplash, and then kick-started this concept with his input — a capable team now holds the reins); or a GitHub-like platform for citizen-led petitions (this idea reached no. 8 on the font page of Y-Combinator's widely read Hacker News site, generating over 19,000 page views in a 24-hour period). I continue to admire the fantastic ideas of others as well, for example Be My Eyes. A new bank-client relationship — fixed margin. Evidence indicates social touch increases physiological coupling during pain; contrarily physiological coupling diminished with pain in the absence of touch. Being honest about behavioral motives doesn’t reduce their effect; there needn't be tension between efficacy and transparency. Clients were solicited by mail and telephone. The overall response rate was 2%, though 15% of those reached by telephone agreed to partake. There was a 35% no-show rate. In sum, 175 out of 25,000 people received a FHC — only 7/10 of 1% of those solicited. On top of that, only 15% of those that did attend actually signed up for automatic savings transfers, bringing the program's intended effects to only about 25 people, or 1/1000 of the group initially contacted. A meta-analysis of similar projects may reveal this is an unacceptable rate of uptake. Evolve to digital by rolling out a Cashcare application owned by a non-profit organization comprised of a bank consortium. The primary solution to scale is rolling out a digital platform to streamline the FHC program — both instructionally and actionably. Section 3c lays out the many possible features such an application might offer to mitigate the impediments to program goals outlined above. These generally take several shapes: harnessing limited self-control through gamification; increasing control through customization; satisfying control through information; reducing time commitment and cognitive overload through convenience and simplicity; and providing comprehensive advice and instruction through trusted in-app support. The app would be owned by a hybrid 501(c)(3) that has partner banks as its members. Expand touchpoints by modernizing and coupling outreach modalities. Reaching clients by mail is likely to be unacceptably ineffective at this point in the advancement of communication. While telephone fared better, cold-calling is nearly as bygone a modality. Email may offer a slight improvement, but it would be best to couple marketing for the program (and a digital application) with other critical communications, like bank, credit card and loan statements. A presence that catches people where they're naturally at — such as schools, community events and grocery stores — is also an option. Finally, directly advertising the Cashcare application in media channels is an efficient means of swelling the program. Centralize coach recruitment, training and placement; incentivize client conversion; and increase the accessibility of support. A uniform multi-media curriculum for coaches should be written and implemented in group settings. The training should emphasize not only financial literacy, but also strategies for building trust and effectuating client conversions by breaking through psychological barriers to relinquishing a small degree of immediate control over income allocation. Coaches could be further incentivized by extension of a commission schedule. Finally, coaches should be accessible at 24/7 call centers, and quickly reachable through the Cashcare application, instead of only personally available on site at bank branches during business hours or through calls scheduled in advance. A feature-laden platform for improving financial health. Automate your budgeting, saving and bill payments. Configure a savings agenda and restraints on spending. Connect live with trusted experts and get targeted in-app advice. Many thanks for reading this far — and a huge thank you for looking further into my work. Review your financial condition, automatically rack up savings, and earn rewards just for securing your future — too good to be untrue. 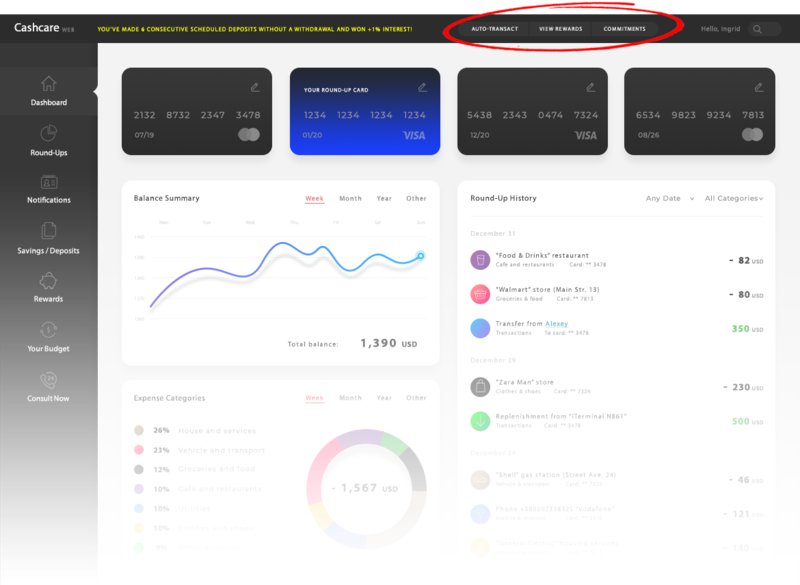 Link your accounts and in seconds your budget is automatically generated — see where your money's coming from and going to, and easily see the difference that's available to save. Set targets and we'll do the rest — or configure a round-up debit card that evens out all your purchases and deposits the difference into your savings account. Meet or exceed your goals, reach milestones, or just get lucky — grab rewards like increased interest on deposits, cash bonuses, discounted credit, and more. Watch your credit score rise in real-time as our algorithms strategically steer your money towards the most impactful debts. Get notifications at insightful moments, or if things don't look right be immediately connected to a trusted representative from your home bank. Customize your level of commitment to saving with an array of methods that can make changing your mind slightly more difficult. "Annual income twenty pounds, annual expenditure nineteen six — result, happiness. Annual income twenty pounds, annual expenditure twenty ought six — result, misery." It's perfectly ok to be all thumbs with your money. 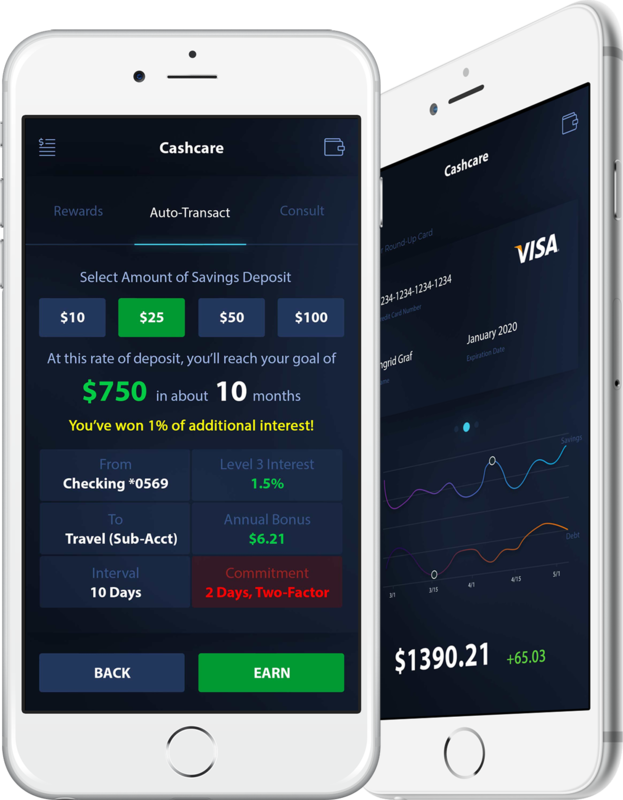 With the Cashcare app you can customize every feature of your account and track your successes — anywhere, anytime. All your accounts are updated in real-time — never miss a beat. Know where you stand with just one click — get a single score for your financial condition with tailored advice on how to improve it. Connect instantly with a representative from your bank to tweak your setup and receive personal consults. We're a hybrid 501(c)(3) supported by a consortium of credit unions. We've built a mutually beneficial link between these banks and their customers. They help us help you, and we help you help them. We don't profit from our service; instead, we are funded only to the extent of our operating costs. Where did the idea for Cashcare come from? Research studies carried out over the last several years show statistically significant positive outcomes in savings behavior when information is coupled with action. Cashcare builds on that research. We don't come out of an oil change with only a brochure, so why should banking be any different? We make it easy to set money aside, track savings growth, and improve your financial health. But to make it stick, we've added a feature set that allows you to control how difficult it is to change your mind — prevent reversal for a couple of days, require two-factor authentication, or configure a combination of hurdles we've designed. What kinds of benefits can I expect from using Cashcare? Foremost, you control your money — so the potential to benefit rests with you. We facilitate your financial wellbeing with an array of tools and relationships. If you take advantage of Cashcare's features and remain disciplined, you might expect to have increased savings, a better credit score, reduced debt, and advantageous interest rates. In short — very. We deploy leading cryptography technology to protect your sensitive information, and we are fully PCI compliant. Cashcare is always running 256-bit SSL encryption to ensure transactions are securely executed. Our professionals work with member banks day in and day out to keep systems functioning reliably. We meet you where you're at — literally. Cashcare hosts workshops nationwide (click here for the schedule). You can find a qualified representative at each participating bank. We also provide information with bank statements and credit card bills, and we offer Cashcare setup help when opening new accounts or setting up direct deposit. Sign up now and we'll match your first deposit. Match available up to $25, cold-hard. All purchases made with this card will be rounded up to the nearest dollar, with the difference going straight into your savings account. We've partnered with 300+ credit unions across the country to make Cashcare accessible to future-seekers just like you. Your financial health relies on a cushion to soften the impact of unsuspecting life events. That's your reason to save. But we want you to save too, because our members do well when their customers do well. The more deposits they hold, the more they earn on investments; the better your credit, the better their lending opportunities. We believe transparency is the best policy — great banking is a partnership, and we're in this together. Talk to an expert who can walk you through setting things up!